Scientists at the Italian Institute of Technology published the first results of the tests carried out with a new 100% organic artificial retina that promises to restore the vision to the people. They developed a artificial retina implant that can restore vision lost in rats. Finally planning to test the procedure on human’s eye later this year. The study has been published in Nature Materials, according to Science Alert. The development of artificial implants related to ophthalmology has advanced considerably in recent years and are one of the main promises to solve the vision problems of millions of people around the world. And, according to the team of scientists from the Italian Institute of Technology, which could be produced later this year. The implant, which turns light into an electrical signal that stimulates retinal neurons, could give hope to millions of people. Who suffers from retinal degeneration – including retinitis pigmentosa (a group of genetic disorders that affect the ability of the retina to respond to the light) – in which photoreceptor cells in the eye begin to break down, leading to the blindness. The retina is in the back of the eye, and is made up of millions of these light-sensitive photoreceptors cells (rods, cones, and photosensitive retinal ganglion cells). But mutations in any of the identified 240 genes can lead to retinal degeneration, where these photoreceptor cells die, even as retinal neurons around them are unaffected. Because retinal nerves remain intact and functional, previous research has studied the treatment of retinitis pigmentosa with bionic eye devices that stimulate neurons with lights, while other scientists have investigated the use of CRISPR gene editing to repair mutations which cause blindness. 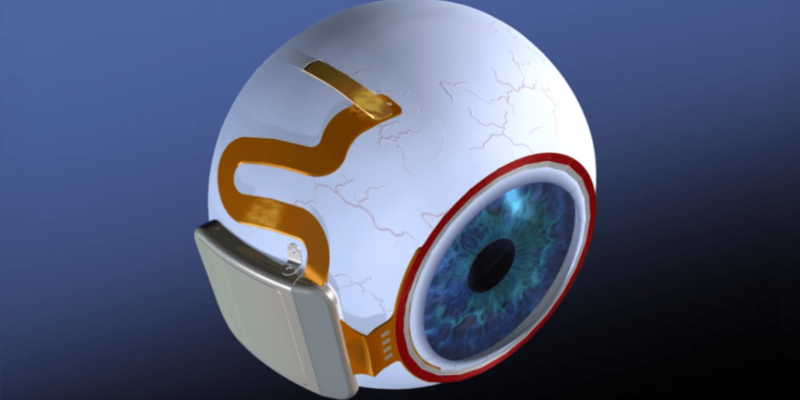 Now, a team led by the Italian Institute of Technology has developed a new approach, with a prosthesis implanted in the eye that serves as a replacement for a damaged retina. The implant is made of a thin layer of conductive polymer, placed on a silk-based substrate and covered with a semiconductor polymer. The semiconductor polymer acts as a photovoltaic material, absorbing photons when light enters the lens of the eye. When this happens, electricity stimulates the neurons of the retina, filling the gap left by the natural but damaged photoreceptors of the eye. To test the device, researchers implanted the artificial retina into the eyes of rats reared to develop a rodent model of retinal degeneration – called the Royal College of Surgeons (RCS) rats. After the rats had healed from the operation 30 days later, the researchers tested how sensitive they were to light – called pupillary reflex – as compared to healthy rats and untreated RCS rats. At a low intensity of 1 lux – a little brighter than the light of a full moon – the treated rats were not much more sensitive than untreated RCS rats. But as the light increased to about 4-5 lux – like a dark twilight sky – the pupillary response of the treated rats was largely indistinguishable from healthy animals. When the procedure was repeated in the rats at six and 10 months after surgery, the implant remained effective in them. They also found that there was an improvement in primary visual cortex activity, which processed visual information, animals to see. Although all rats in the tests (including treated rats, healthy animals and SCC) deteriorated Slight of vision. Using positron emission tomography (PET) scanning to monitor brain activity of rats during light sensitivity tests, researchers saw an increase in activity of the primary visual cortex, which processes visual information. Compared with the currently available artificial retina models based on silicon technology, the new prototype has obvious advantages, such as tolerance, long life and autonomy, as it does not need an external power source. This important functional recovery did not lose efficacy for more than 10 months after implantation of the artificial retina, without causing inflammation of the retinal tissue or the degradation of the materials constituting the prosthesis. Based on the results, the team concludes that the implant directly activates “residual neuronal circuits in the degenerate retina,” but more research is needed to explain exactly how stimulation works at the biological level. “The detailed principle of operation of the prosthesis remains unclear,” they explain in their article. Although there is no guarantee that the results observed in rats will happen in the same way in people, the team expects this to happen. “We hope to reproduce in humans the excellent results obtained in animal models,” says one of the researchers, the ophthalmologist Grazia Pertile, of the Sacred Heart Don Calabria in Negrar, Italy. “We plan to conduct the first trials with humans in the second half of this year and gather preliminary results by 2018. This implant can be a “turning point in the treatment of diseases that weaken the retina”.